Dark McLean is in a terrifying race to find a cure for the mystery illness that is rapidly killing his uncle. Shadowed at every turn by a sinister neighbour, his courage and friends start to fail him. In desperation he returns to a forbidden fairy fort where he crosses into the ancient realm of Fionn Mac Cumhaill. There Dark learns of Matha, a young man who is on a weirdly similar quest to his own. To buy the printed edition click here. To buy the Kindle edition click here. 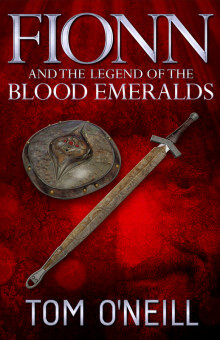 To buy the ePub edition Fionn and the Legend of the Blood Emeralds - Tom O'Neill" target="_blank" >click here. Tom O’Neill was brought up in a farming family in County Carlow. He worked as a science teacher trainer in Southern Africa and later developed online education. Since his return to Ireland he has farmed in County Kilkenny and restored Killahara Castle in Tipperary. He has always written. When he helped his father publish a social history he was reconnected with stories and beliefs that were still vibrant in his own childhood and which resonated with his experience in Africa. This resulted in the coming together of his tales of Dark and Fionn Mac Cumhaill. He previously published: Old Friends: The Lost Tales of Fionn Mac Cumhaill (Little Island Books).